It’s playoff time again, which means it’s also time for our Breaking It Down series. That’s where I – and I alone – take a look at the post-season matchups and provide is a snapshot of the action to come. 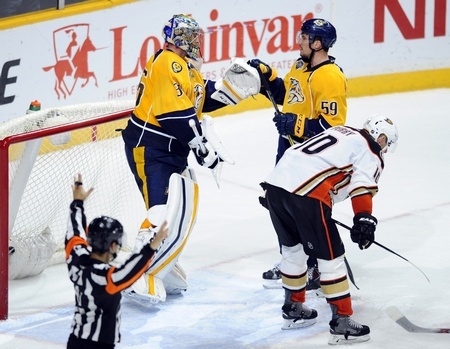 This edition features a look at the Western Conference bout between the Anaheim Ducks and the Nashville Predators. Game One is on Friday. The last series to start in the post-season also has the possibility of being one of the toughest. The Predators and Ducks will have to put in a lot of travel, with Anaheim having to fly 1,800 miles each way and rolling through two time zone changes. The Ducks will also be facing a Nashville team that can put together some considerable offence, with two 30-goal scorers in the roster for the first time in a decade. Predators head coach Peter Laviolette has some serious playoff experience and he’s put in a system that his club can get behind. He won a Cup with Carolina in 2006 and led the Philadelphia Flyers to the Final four years after that. Bruce Boudreau, Anaheim’s bench boss, has had trouble sealing out Game Sevens and struggled to hold his job during some questionable days with the Ducks this season. Something’s got to give here. Frederik Andersen and John Gibson held Anaheim in a lot of games this season, especially when the offence couldn’t get going. Andersen started 37 games and put up a 22-9-7 record, with a 2.30 goals against average and a .919 save percentage. And Gibson saw 38 starts, with a 21-13-4 record with a 2.07 goals against average and a .920 save percentage. When it comes to post-season experience, Andersen is the guy. He went 11-8 in the 2015 run and has the support of his teammates. Nashville will hope that Pekka Rinne is ready to take the next step in the post-season. He’s been stellar in the regular season. This year, he saw 66 starts and posted a 34-21-10 record with a 2.48 goals against average and a .908 save percentage. He had four shutouts and played the second-most minutes of any netminder. But he’s never guided the Predators out of the second round. Nashville loves to lug the puck up from their own end and their defenders power the attack, with Roman Josi often leading the charge. The 25-year-old from Bern had 61 points this season, including 14 goals, and he’s been steadily increasing his value every year. Pairing Josi with Shea Weber has been a wise move since day one, with the Mattias Ekholm and Ryan Ellis duo also providing nice balance. The Ducks have pushed the Hampus Lindholm and Josh Manson pair to the moon and to great effect, with Lindholm showing an ability to shut down the opposition. In his third full NHL season, he’s also shown a knack for joining the rush. Cam Fowler and Kevin Bieksa form the second pairing (sometimes the first). Fowler is already a veteran of league at age 24, while Bieksa puts up big minutes and kills penalties. Anaheim has seen inconsistency plague their offensive abilities in large swaths of the regular season, with key injuries slowing progress. David Perron and Rickard Rakell are currently on the shelf, although the Ducks figure they’ll be back at some point in the first round. And Ryan Getzlaf had an off year by his standards, putting up just 13 goals. Corey Perry finished with 62 points, including 34 goals, and he’ll need to find more consistency on the second line when Rakell returns. The Predators have found serious value in James Neal and Filip Forsberg, with the two forwards topping 30 goals. 28-year-old Neal had 31 goals in 82 games, while Forsberg has 33 goals and has found chemistry with Mike Ribeiro and Craig Smith. The addition of Ryan Johansen in the Seth Jones trade has given Nashville more offensive balance, with the 23-year-old putting together 60 points in 80 games. The Preds can also throw veteran Mike Fisher in the mix. He could be a game-changer. The Predators could prove a handful for the Ducks in the first round, but Anaheim won’t go away quietly. They boast the top power play in the league and the top penalty kill, marking the first time since the Islanders of 1984-1985 that the same team has owned the best special teams. Ryan Kesler has added a boost to the second unit and he’ll be a pest throughout the series. But Nashville has the ability to shut it down and they may well succeed. The Ducks have been disappointing in the post-season and never quite seem to live up to billing, whereas the Predators could surprise by limiting turnovers and playing a speed game. If they can close up space and take over with quality coverage, they can turn the Ducks aside. Given the available evidence, I can safely say the Nashville Predators will seal the deal in seven games.